Some of the toursts I have guided enjoyed taking pictures during the tour. She was one of them. She brought three kinds of lenses and a single-lens reflex camera. She used each lense according to the scenes and the objects. In addition, this was their honeymoon! 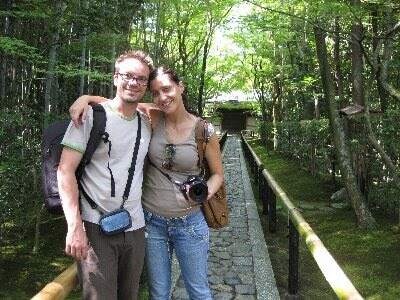 We started the tour from their hotel, Mume hotel, in Gion. 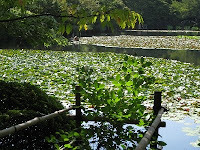 As they had walked and walked in the eastern area the day before, we decided to start our tour from Nijo castle. I like taking photos,too, and I have a CANNON single-lens reflex camera( though I usually don't take it because it needs more space in my bag) Just seeing someone taking photos with such a camera is much fun to me. 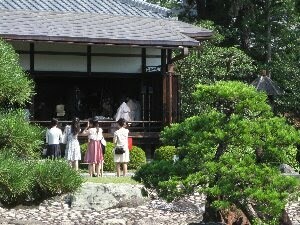 When we got out of the garden of Ninomaru Palace(Nijo castle), I heard the music usually used for the Shinto style wedding. So, we changed the direction and went to Seiryoen in the palace. This was the second time to see the wedding. Later we talked about their wedding and her beautiful wedding dress. I took a look at the pictures of her wedding dress stored in her camera! The dress was very very long, gorgeous. It was the very dress that she had dreamed of. That was the first dress she saw at the shop, and at the momonet she saw this dress, she decided without hesitation to make it her wedding. Yes, it was really a wonderful and beautiful dress. 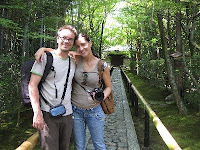 Koto-in in Daitokuji temple was their request. 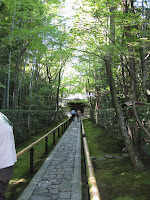 The next leg was Koto-in, one of my favorite tempels. It was as beautiful as usual. I especially like the path to the entrance. I came Ryoanji rock garden and Golden Pavillion so many times as a guide. 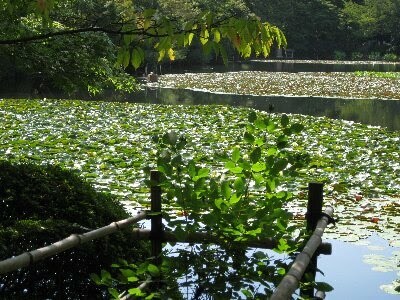 But this time, I was impressed lotus flowers on the pond. It was most beautiful this season. a lotus flower is said to be a flower of truth in Buddhism. That's why there are so many lotuses here. After that we went to walk in Bamboo forest and along the riverside of Hozu river.